World premiere in a Royal Park: Today, Friday, Porsche has unveiled the new 919 Hybrid at the Autodromo Nazionale di Monza. The Le Mans prototype, that delivers a system output of around 900 PS (662 kW), was comprehensively reworked. Porsche aims for a hat-trick with it: Target is to win the Le Mans 24-hours race (June 17/18) as well as the FIA World Endurance Championship titles for Manufacturers and Drivers respectively for the third consecutive time after 2015 and 2016. The 2017 model of the Porsche 919 Hybrid deploys a range of new innovations, particularly in the vehicle’s aerodynamics, the chassis and the combustion engine. Team Principal Andreas Seidl, who continues to serve as acting technical director, reports: “For the 2017 season, 60 to 70 per cent of the vehicle is newly developed. The basic concept of the 919 Hybrid still offers scope to optimise the finer details and further boost efficiency. The monocoque has remained unchanged since 2016, but the optimisation potential of all other components was analysed and, in most cases, adjustments made accordingly.” As in Formula 1, the monocoque is made from a carbon-fibre compound using a sandwich design. The technical regulations for the 2017 FIA WEC World Endurance Championship introduce further limitations in terms of the dimensions of some body components that affect aerodynamics. In an effort to increase safety, the new measurements reduce the downforce of the LMP1 prototypes, which in turn lowers the vehicle’s cornering speed for safety reasons. Based on the new specifications and developmental findings, the Porsche engineers devised two brand-new aerodynamics packages for the 919 Hybrid – driven, of course, by a desire to compensate for the increased lap times resulting from the regulatory requirements. In 2016, Porsche delivered three aerodynamics packages for the season, but the new regulations have also imposed limits on numbers. Andreas Seidl: “Limiting teams to two aerodynamics packages per season is a sensible cost-control measure”. One of the new aerodynamics packages is specifically designed for the high-speed track at Le Mans. To achieve maximum top speeds on the extremely long straight sections, the package design focuses on minimising air resistance. The second aerodynamics package compensates for a higher level of drag with greater downforce for tracks with twists and turns. Track-specific fine-tuning is still permitted, but in general, 2017 will involve a higher level of compromise than was the case with the three aerodynamics packages of the previous year. When comparing a front view of this year’s 919 to the previous year’s model, the higher, wider and longer wheel arches immediately catch the eye. To the side, the new channel from the monocoque to the wheel arch is visible, along with the redesigned rear air intakes for the radiators. Alongside the mechanical enhancements made to the chassis, a number of software innovations have helped to further improve the driving quality of the 919, particularly in terms of traction control and hybrid management. Both of these factors have a significant impact on the service life of the tyres, and this consideration is set to take on even greater importance in 2017. LMP1 teams will now have three sets of tyres fewer available to them for each race weekend and car, so tyre sets will need to withstand double stints of racing on a more frequent basis – lasting the equivalent of two tanks of fuel, or a driving time of around one and a half hours. Andreas Seidl: “Working together with our partner Michelin, we have prepared intensively so that we are able to keep up the pace right through to the end of the race, even when we’re driving in double stints. 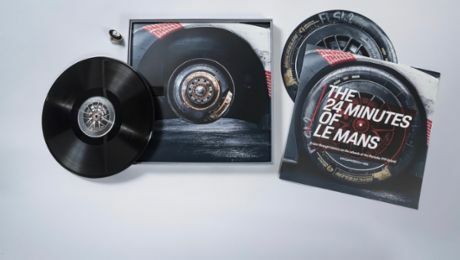 All the races, whether six hours or 24 hours in duration, will be real sprints to the finish this year, too.” During the night at Le Mans, when temperatures are cooler, even quadruple stints on one set of tyres are possible. With its unique efficiency regulations for Class 1 Le Mans prototypes (LMP1), the WEC represents an ideal platform for Porsche – and it was these regulations that fuelled the company's return to elite motorsport in 2014. The regulations provide engineers with an unusual degree of freedom to introduce different drive concepts and require forward-looking technologies such as hybridisation, highly efficient engine downsizing and consistent use of lightweight construction. As a re sult, the WEC provides the perfect platform for Porsche to develop and test innovations for road-going sportscars. As part of the package of enhancement measures, the Porsche engineers have boosted the efficiency and performance of the drivetrain. The transmission on the front and rear axle, the combustion engine, the electric motor and the energy recovery systems have all been optimised, but the basic principle behind the drive system is unchanged: The rear axle of the 919 is driven by an extremely compact two-litre V4 combustion engine. The engine combines downsizing turbo technology with efficient direct fuel injection; it delivers just under 500 hp (368 kW) and is the most efficient combustion engine in the history of Porsche to date. Two different energy recovery systems – a braking energy recovery system on the front axle plus an exhaust energy recovery system – feed a lithium-ion battery, which in turn powers an electric motor capable of supplying additional power of over 400 hp (294 kW) to the front axle on demand. The 919 Hybrid, developed in Weissach, is the only prototype to recover energy during acceleration as well as braking. It achieves a system power of more than 900 hp (662 kW), profiting from the enormous traction generated when the car accelerates out of bends with a further 400 hp of power on the front axle, transforming the 919 into an all-wheel drive. Approximately 60 per cent of the recovered energy comes from the KERS (Kinetic Energy Recovery System) on the front-axle brakes. The remaining 40 per cent is generated by the exhaust energy recovery system. An average of 80 per cent of the braking energy recovered from the front axle is immediately converted to drive energy. If the combustion engine was required to supply this electrical power, it would need to boost its output by over 100 hp (74 kW), which would increase the fuel consumption of the 919 by more than 20 per cent. At Le Mans, this would equate to an extra litre of fuel per lap. A further advantage of the highly efficient recuperation system is that it enables the 919 to perform with smaller and lighter brakes – a characteristic that not only reduces weight, but also air resistance, as smaller brakes require less cooling air. To recover exhaust energy, a small turbine is fitted in the exhaust tract. This turbine runs at a speed of more than 120,000 rpm, powering a generator. Just like the energy recovered from the front brakes, the energy generated is stored in the lithium-ion battery until it is needed. The driver can access this stored energy on demand at the push of a button – using it to boost the car as it speeds out of a cornering manoeuvre while simultaneously replenishing the energy from the exhaust gas generated during acceleration. To ensure that the turbine functions just as efficiently at lower speeds, when exhaust pressure is low, the turbine features variable turbine geometry. In spite of the sophisticated technology on board, the engineering team was still able to achieve a weight reduction in the exhaust system. The 919 will start again in the highest energy efficiency class prescribed by the regulations. This means that the car can use 8 megajoules of recovered energy over the 13.629-kilometre (8.4 mile) track in Le Mans, subject to the restriction that it may only consume a maximum of 4.31 litres of fuel to do so. Both consumption values are closely monitored and totalled up after each lap. From tomorrow, the first meeting of the WEC contenders is on. At the WEC’s so-called Prologue, there will be a total of 14 hours joint testing. On Saturday this also goes on for two hours after sunset. The Porsche LMP Team will run both cars on both days. The hybrid racing car with starting number 1 will be driven by Neel Jani (33, Switzerland), André Lotterer (35, Germany) and Nick Tandy (32, Great Britain). Jani is currently joint WEC World Champion and 2016 Le Mans winner. Lotterer claimed the title of World Champion in 2012 behind the wheel of an Audi and brings with him the experience gained from three overall victories at Le Mans, while Tandy formed part of the winning 2015 Porsche team in Le Mans. The sister car with starting number 2 will be shared between 2015 World Champion Timo Bernhard (36, Germany) and the two New Zealanders Earl Bamber (26) and Brendon Hartley (27). 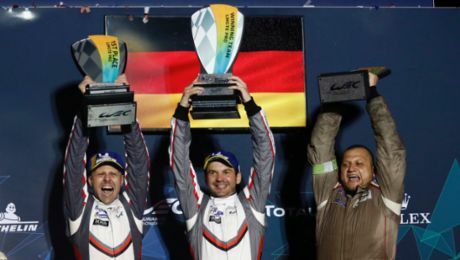 Bamber claimed joint victory with Tandy at Le Mans in 2015, while the same year saw Hartley share the title of World Endurance Champion with Bernhard. 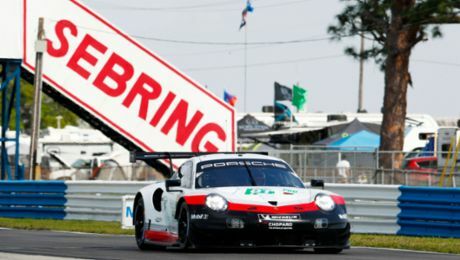 WEC: Gianmaria Bruni and Richard Lietz finished round six in Florida in first place with the 911 RSR. From March 13-16, the GT teams field four works vehicles in two long-distance races at Sebring (USA).